Because the design and retailing of fashion is a global phenomenon, it should come as no surprise that learning institutions around the world prepare graduates for careers in the international fashion industry. Training ranges from vocational to creative to theoretical and results in certificates and diplomas (one to three years), which include associate (two years), baccalaureate (four years), master (master of arts, M.A. ; master of fine arts, M.F.A. ; and master of sciences, M.S.) and doctoral (doctor of philosophy, Ph.D.; doctor of education, Ed.D. ; and doctor of art, D.A.) degrees. Programs that offer certificates and diplomas tend to exist as part of vocational institutions, and curriculum is focused exclusively on preparing students for industry employment. Baccalaureate programs, in contrast, tend to vary in scope. While some colleges and universities balance a major in fashion design or retailing with required general or liberal education courses that expose students to a broader worldview, other four-year institutions concentrate solely on the theory and practice of art and design and all curriculum offerings stem from that singular mission. Graduate work is meant to be more focused, and degrees are offered in the areas of retailing, design, textile science, and history. Many universities around the world also offer more flexible graduate programs under such names as Fashion Studies or Clothing and Textiles. The fashion industry reaches around the world, with degree-earning opportunities that provide training on every continent in fashion design and retailing. The United States is home to over 250 institutions of higher learning that include programs in fashion design and retailing. Many of these offerings are housed in colleges or departments that have evolved from the home economics tradition. Consequently, virtually every state in the United States has a university with undergraduate and graduate curriculum in retailing and fashion design. As programs have expanded and contracted, a variety of names have emerged. Such college or department names as Human Ecology, Environmental Sciences, and Family and Consumer Sciences represent a general definition of the changing disciplines included in the mission. Design, Housing, and Apparel, Apparel Merchandising and Interior Design, and Merchandising and Hospitality Management represent more specific program orientation. When searching for fashion design and retailing programs at the university level, these are among the many terms and phrases to consider. Within this type of university system, the retailing or fashion design major program is enriched with required general or liberal education courses that introduce students to a broader perspective on the global community. Students are able to earn a bachelor's degree, and many departments also offer master's and doctoral degrees. Within the United States, there are also colleges, schools, and universities of art and design, with four years of curriculum that refine and focus students' individual vision and aesthetics related to fashion design, complementing the development of creative skills with an expanded understanding of design theory. Graduates of these institutions have the opportunity to earn a variety of degrees, including an associate of arts (A.A.), bachelor of arts (B.A. ), bachelor of fine arts (B.F.A. ), master of arts (M.A. ), and master of fine arts (M.F.A.) degrees. In addition, an abundance of vocational and technical schools and art and design institutes offer focused one- to three-year programs in the areas of retailing and fashion design. Degrees earned include associate of arts (A.A.) and associate of applied sciences (A.A.S. ), and students are prepared for specific positions within the fashion industry. 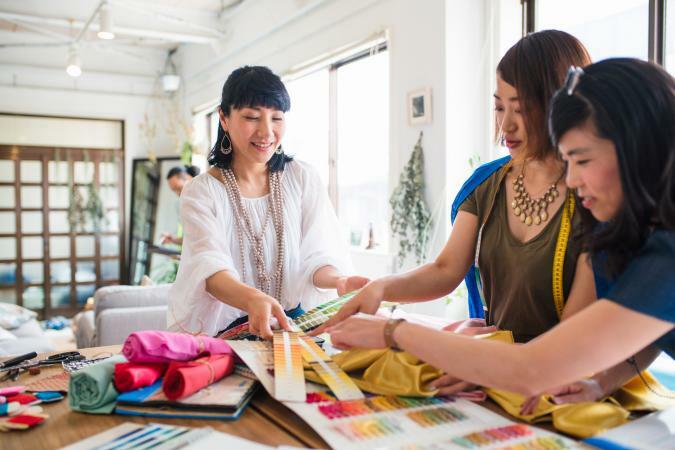 Six Canadian provinces have more than ten notable educational institutions that offer programs in fashion design or retailing. Students are able to earn bachelor, master of science, and doctoral degrees within departments of Human Ecology in the general areas of Clothing and Textiles. Bachelor of applied arts or bachelor of design degrees are also available at technical universities. Several vocational and technical institutions offer certificates and two-year diplomas that prepare students for the business and creative sides of the fashion industry. There are well over one hundred learning institutions in twenty-seven countries across Europe that include fashion design or retailing in their curriculum. Because London, Paris, and Milan continue to function as celebrated international fashion centers, the United Kingdom, France, and Italy warrant individual consideration. There are also significant and interesting educational opportunities in Scandinavia, Central and Eastern Europe, and the other Western European countries. With London as one of the premier world fashion centers, it makes sense that more than forty educational institutions offering programs in fashion design or retailing are situated throughout England, with one or two in Scotland, Wales, and Northern Ireland. Learning opportunities range from vocational and technical training to prestigious art schools and universities. Completion is designated by National Diploma/Certificate (ND/C), generally a one-year technical degree; Higher National Diploma (HND), an additional year beyond earning of a certificate; and Bachelor of Arts Honors (B.A. Hons.) or Bachelor of Science Honors (B.S. Hons. ), typically a three- or four-year advanced degree comparable to a four-year degree earned at a U.S. institution. Master and doctoral degrees can be earned at a few institutions, including more traditional university systems as well as those focused specifically on art and design. Paris is home to France's five premier learning institutions with programs in fashion design and retailing. Two institutions offer curriculum in English and are organized for international students who desire short-term (four weeks) or long-term (three years) study-abroad opportunity in the areas of retailing or fashion design. Certificates and bachelor degrees can be earned, and credits may be transferred to colleges and universities at both the graduate and undergraduate levels. The other specialized schools are organized in the manner of art and design schools and offer one-, two-, or three-year programs in textile design and fashion design. Italy has more than twenty design and retailing academies and institutes scattered around the country, with several more prominent programs in such vibrant international fashion centers as Florence, Milan, and Rome. Students are presented with a range of opportunities: one-, two-, three-, and four-year programs, summer short courses, workshops, and practical training in all facets of the fashion industry. Several academies offer programs of varying lengths for international students who choose to study fashion in Italy. All programs, regardless of length, are part of academies or institutes that focus solely on the practical and theoretical aspects of design and retailing. Many of the learning institutions are directly linked with professionals in the Italian fashion industry, providing students with opportunities to train and network with potential employers. While not as heavily concentrated, over thirty-five institutions offering fashion design and retailing are distributed throughout the remainder of Western Europe in such countries as Austria, Belgium, Germany, Greece, Ireland, the Netherlands, Portugal, Spain, and Switzerland. Diplomas, bachelor, and a few graduate programs are available throughout the region. There are several opportunities for earning degrees in retailing and fashion design in such countries as the Czech Republic, Estonia, Hungary, Latvia, Lithuania, Poland, Romania, Russia, Slovakia, Slovenia, and the Ukraine. Lithuania, Poland, Slovakia, and Russia have particularly impressive and extensive offerings, with bachelor and graduate programs. Scandinavia has long enjoyed a rich craft tradition, which continues to be nurtured through university curriculum offerings. Norway, Sweden, and Denmark have institutions that offer two- and four-year degrees in both fashion and textile design. In Finland, students can earn bachelor, master, or doctoral degrees in textiles, clothing, or craft design within such departments as Textiles and Clothing and Home Economics and Craft Science. Fashion education is prominent and tremendously active in China, India, and South Korea and is the focus of this section. However, exciting educational opportunities also exist in Japan, Malaysia, Philippines, Singapore, and Vietnam. Including the People's Republic, Taiwan, and Hong Kong, China has much to offer in the educating of professionals in the areas of clothing design and textile technology. Students are able to earn certificates and diplomas, bachelor of arts, bachelor of science, masters, and doctoral degrees at several institutions. Some institutions focus on textiles and apparel programs that include studies in textile science and textile technology. College names such as Home Economics and Human Ecology emerge in institutional literature, suggesting that some Chinese clothing and textiles programs are modeled after U.S. offerings. The country of India is a hotbed of international apparel and footwear manufacturing companies. Educational institutions have responded to the need to train professionals and over fifty-five institutions offer programs in fashion design and retailing. The majority of curriculum focuses on fashion design and technology, although a few programs offer degrees focused on the business side of the apparel industry. Degree opportunities range from technical diplomas and certificates in such areas as apparel production competencies (garment fabrication, sketching, cutting, tailoring, embroidery, and computer-aided design [CAD]) and fashion retail management, to four-year bachelor degrees in fashion design. Within South Korea, more than forty universities and colleges offer two-year, four-year, master's, and doctoral degrees in the areas of fashion design and retailing. These programs emerge from such divisions as Human Ecology, Home Economics, Clothing and Textiles, Fashion Design, and Fashion Marketing. Two- and four-year degrees prepare students for careers in the textile and apparel industry. Graduate curriculum focuses specifically on textile and apparel industry issues, including technological expertise and economic trends. There are more than twenty institutions located in the Oceanic region, with programs that focus on fashion design, retailing, and textile technology. Australia boasts several programs with certificates and diplomas, bachelor's, master's, and doctoral degrees. New Zealand is home to a dozen universities, institutes of technology, polytechnics, and colleges of art and design with a focus on fashion design and retailing. A degree in apparel merchandising and fashion design is also available in Papua New Guinea. Within these Oceanic countries, certificates and diplomas are earned in such areas as clothing production, textiles, footwear production, and fashion design. Bachelor of science degrees are available in Textile and Apparel Management and bachelor of arts degrees are available in Fashion and Textile Design. Iraq, Israel, Saudi Arabia, and United Arab Emirates in the Middle East; Argentina, Brazil, Chile, Uruguay in South America; Mexico in North America; and the African countries of Congo, South Africa, and Zimbabwe also have universities and colleges that offer stimulating two- and four-year degrees in fashion design and fashion marketing. This overview on fashion education reveals three important points: (1) fashion education is offered on every continent around the world, (2) training professionals for the international apparel industry takes many forms, and (3) there exists a reciprocal relationship between the international fashion industry and educational training in the areas of fashion design and retailing. In geographic regions around the world where design is celebrated, there are fashion design schools (Italy, France, and England). Locations with a multitude of apparel manufacturing sites tend to be breeding grounds for training in technical and creative competencies (China, India, and South Korea). Educational institutions continue to recognize and address the essential needs of the fashion industry. See also Fashion Advertising; Fashion Designer; Fashion Editors; Fashion Illustrators; Fashion Industry; Fashion Journalism; Fashion Models; Fashion Photography. The World of Learning: The Definitive Guide to Higher Education World-wide. London: Europa Publications, 2003. Education Institutes in India: Fashion and Design. 2003. Available from http://www.webindia123.com/career/fashion/list.asp?action=Fashion+Technology . International Directory of Design. 2003. Available from http://www.penrose-press.com . International Textiles and Apparel Association Directory. 2003. Available from http://www.itaaonline.org .